A number of TFT solutions are offered. Serial TFT, I2C TFT, USB TFT, RS422 TFT, SPI TFT and Parallel 24bit RGB TFT. TFT, or Thin Film Transmissive, display technology uses the same control techniques as an LCD, but permits larger screen sizes by adding transistors to address pixels by row and column rather than individually. Additionally, TFT units offer red, green, and blue elements for each pixel to produce a full range of colour output. The brightness of each colour element is individually controlled by a number of bits, typically between 5 and 8, to produce up to 16 million colours. These units are driven by an LED backlight which requires moderate power input, and can be varied to control brightness, typically up to 600 nits. These units have an operating range similar to LCDs of -20C to 70C, but offer increased contrast performance, typically up to 500:1, and viewing angles of up to 140 degrees. High display resolution and touch overlay options make this technology attractive to higher end HMI applications. TFT is available on GTT, EVE2, HTT and Parallel Displays. 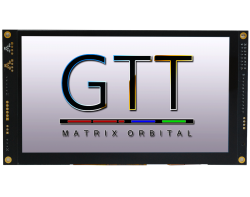 TFT is available on GTT, EVE2, HTT and Parallel Displays. 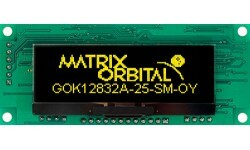 A number of LCD solutions are offered. Serial LCD, I2C LCD, USB LCD, RS422 LCD, and Parallel 4/8bit LCD displays. LCD, or Liquid Crystal Display, technology uses electrical current to control the passage of light through individual characters or pixels. These displays are typically backlight in a variety of different, but monochrome colours. This scheme typically provides medium brightness, between 100 and 300 nits, with moderate viewing angles of 50 to 70 degrees. Input power to the backlight can be varied to balance viewing and electrical needs. The operating temperature range of these units is typically limited to between -20C and +70C, and contrast performance is low, typically up to 4:1. However, this common display technology has proven to be versatile to a variety of different applications. A number of VFD solutions are offered. Serial VFD, I2C VFD, USB VFD, RS422 VFD, and Parallel 4/8bit VFD Displays. VFD, or Vacuum Florescent Display, technology uses florescent sections inside a vacuum to illuminate characters or pixels in a vibrant blue-green colour. 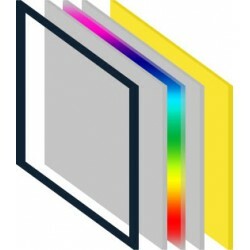 Optical filters can be added to change the display colour, and improve sunlight readability. This technology offers high brightness, typically 350nits, but requires significant power input. These displays offer a wide operating temperature range, typically -40C to +85C, and wide viewing angles of up to 170 degrees. A lengthy mean time between failures, typically over 1 million hours, means this technology is well suited to demanding industrial applications. VFD is available on Intelligent, Economy, and Parallel Displays. A number of OLED solutions are offered. Serial OLED, I2C OLED, USB OLED, RS422 OLED, and Parallel 4/8bit OLED displays. OLED, or Organic Light Emitting Display, technology uses organic light emitting diode segments to illuminate characters or pixels. A wide variety of colours are available, and each offers high contrast of up to 2000:1. This technology provides a wider operating temperature range of -40C to +85C and wide viewing angles of up to 160 degrees. Low input power requirements make OLED technology attractive for embedded applications. OLED is available on Intelligent Displays.